Revolutionary research could find markers for diseases like Alzheimer's years ahead of the illnesses even developing, scientists believe. This could pave the way for developing fresh ways of treating patients, the UK Biobank Imaging Expert Working Group says. Its leaders put its importance akin to the initial link made between smoking and lung cancer . The study project revolves around imaging and is the biggest of its type in the world. Nowhere else has there been a larger gathering of scans showing internal organs. 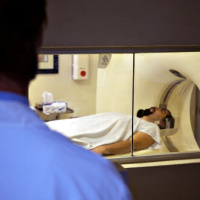 As many as 100,000 people will be scanned by high-tech imaging procedures, such as MRI machines. Holidaymakers suffering with cancer, heart disease or Alzheimer's can still easily head abroad with peace of mind after taking out medical problem-related travel insurance. Such cover can reimburse tourists if they require 24/7 medical attention or misplace their medication. It also protects them against unexpected surprises, such as delayed or cancelled flights and lost or stolen possessions. Previously researchers have only had hundreds of patients' scans to draw upon in their studies. This new research will expand the database to tens of thousands of scans, greatly improving the "quality" and "scope" of the studies. Prof Matthews says this one huge study has massive advantages over previous smaller-scale ones, including lower costs. He says the research has the potential to find clues to Alzheimer's and other diseases earlier than ever before. Prof Matthews thinks the new UK Biobank initiative could help scientists to look at health in a holistic fashion. The British Heart Foundation, Medical Research Council and Wellcome Trust are all financially backing the project. Experts say it could revolutionise the way in which researchers study dementia, strokes, heart attacks, arthritis, cancer and other illnesses.